Using Transaction SM64 and SM62. You can create and display "User Event Names" via SM62. 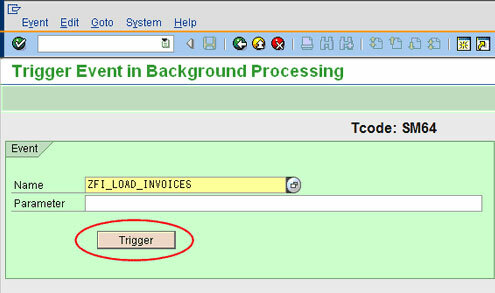 An SAP event is a “flag” that is created by using transaction SM62 View and Maintain Background Events. The commonest use of Events is to trigger jobs. Events can be triggered from the Operating System or from within SAP – either within ABAP programs and Function modules or from Transaction SM64. Create an Event in transaction SM62. Select the Maintain radio button next to User Event Names and execute. This will present you with the Edit User Events screen. You can add change or delete user events from here. Transaction SM62 is used to create SAP events, transaction SM64 is used to trigger SAP events within the application, and SAPEVT.exe is used to trigger SAP events while outside the application. Transaction SM36 is used to create background jobs and transaction SM37 is used to monitor and manage background jobs. To use this Event as a trigger, create a job via transaction SM36. You specify the Event that will trigger this job using the Start Condition button. On the Start Condition screen, select option AFTER EVENT. The After Event fields will open for input. Fill these in and Save. To trigger an event, run transaction SM64 and specify the event name. SAPEVT.exe is part of the R/3 Kernel and located under the usrsapsysexerun directory on the central instance. SAPEVT is a stand-alone executable that can be copied into remote computers. That's right! You can execute an event right from your laptop or desktop computer. So, is there anything else required on the remote computer besides the executable? Yes. You need to have an entry in the "services" file with the TCP port for the SAP messenger of the SAP instance. You can edit the file with Notepad or any plain-text editor and add the necessary entry at the end. The file is located under the %systemroot%system32driversetc directory. Also, please notice that you need to have read access to the "default.pfl" file on the SAP instance.